The only natural foolproof dairy cream product with 15% fat for use in cold savoury and sweet dishes. QimiQ Classic is available in natural or vanilla flavour. QimiQ Classic is a functional ingredient. 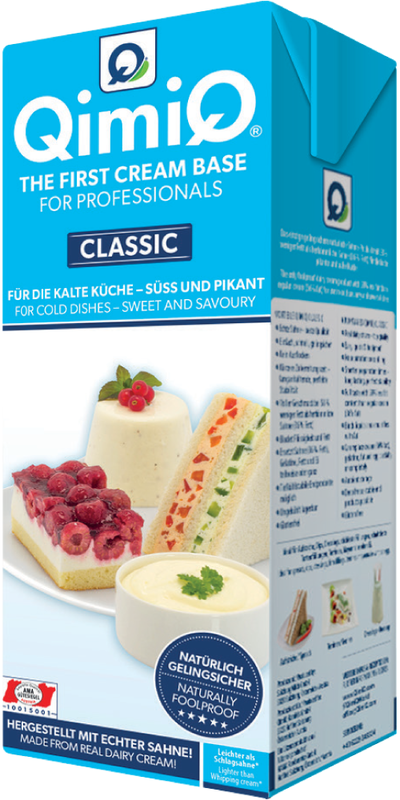 QimiQ Classic is used for cold end products requiring stable consistency: spreads, dressings, dips, firm fillings, mayonnaise without egg and sweet application such as Panna Cotta. QimiQ Classic is used as a flavour carrier. QimiQ Classic cannot be whipped to produce volume. QimiQ Classic is bake stable. Longer presentation time - longer sales period. No moisture migration – sandwiches remain fresh and dry. Dressings do not separate and stick better to the salad. Longer presentation times – increased sales period. The only flavour carrier which enhances rather than conceals the taste of added ingredients, enabling the reduction of expensive and/or fatty ingredients (eg. smoked salmon, truffle oil, foie gras). Acid and alcohol stable and will not curdle, thanks to its fine, compact structure and the unique protection of the milk protein resulting from the special patented production process. Contains 58% less fat than traditional cream with 36% fat, whilst maintaining full flavour. QimiQ Classic can replace fatty ingredients like cream, butter and, oil partially or completely. QimiQ Classic is best used at room temperature (20°C - 25°C). If used chilled, simply whisk QimiQ Classic a little longer until completely smooth. Whisk QimiQ Classic smooth with a hand whisk or mixer / cutter. QimiQ Classic can be stored ambiently and unopened for up to 12 months. Once opened, QimiQ Classic should be stored in the refrigerator and used within 3-4 days. QimiQ Classic consists of 99% half cream (15 % fat) and 1% top quality gelatine. QimiQ Classic is a real dairy cream product (no declarable ingredients / additives) and is gluten free. QimiQ Classic Vanilla consists of 93% half-cream (16,2% fat), sugar, gelatine, starch, vanilla extract, flavouring, colour beta carotene. QimiQ Classic products contain all the benefits of milk, including high quality protein, calcium and phosphorus and therefore offer an important contribution to a healthy diet.